April is the ideal time of year to give your wardrobe a stylish spring update with these fabulous Reformation dresses. This environmentally cautious brand prides itself on sustainable, contemporary fashion using renewable and eco-friendly fabrics and processes. Their effortless and wonderfully modern silhouettes are simply made for spring. They’re perfect for every occasion, from garden parties to picnics on the beach. 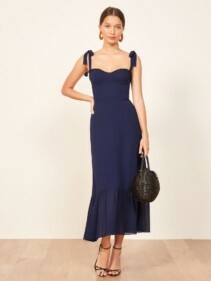 Aid the environment and your wardrobe simultaneously by shopping our irresistible edit of Reformation dresses for spring! Finding versatile items is key when piecing together your new season wardrobe, so we’re absolutely loving these monochromatic Reformation dresses. The perfect black dress for spring comes in the form of the Shelley dress with decorative lace panelling. This stunning frock has adjustable spaghetti straps and a wonderfully flattering deep V-neckline. Additionally, it features a centre front tie on the lined bodice and pretty lace trim around the waist. This matches beautifully with the trim on the midi length skirt which falls to the ideal mid-calf length. Style this stunning button-up dress with espadrilles and a simple basket bag. Alternatively, you’ll be an absolute vision in the expertly embroidered Elsie white dress. This dress offers a classic crew neckline and centre front button detailing. The delicate embroidery is absolutely stunning and truly elevates the overall look of this slightly sheer midi dress. Finally, the fitted bodice shapes and defines your figure whilst the long sleeves provide an elegant finish. There’s nothing like a charming print to welcome the arrival of spring and these Reformation dresses certainly have you covered! We are head over heels for the linen Dolci dress which is ideal for spring and for summer. The sweetheart neckline further elevates the adorable floral print whilst complimenting the shapely bodice. In addition, the pretty trumpet skirt has the perfect amount of volume and pairs ideally with flat summer sandals. For more formal occasions we highly suggest the Ingrid navy floral printed dress. This showstopping maxi dress offers adjustable/removable straps for your preferred fit and neckline. It is also fully lined with a fitted waist and smocked back bodice to flatter your shape. A sultry thigh-high split finishes off the skirt making this maxi ideal for pairing with high heeled sandals.